I know I often link people with their long-lost childhood books, but this might be the first time I helped to reunite someone with their ACTUAL long-lost book. Meet Paul, who recognized his own name in an inscription I quoted from a vintage copy of the Roy McKie classic I Can Write! A Book By Me, Myself. 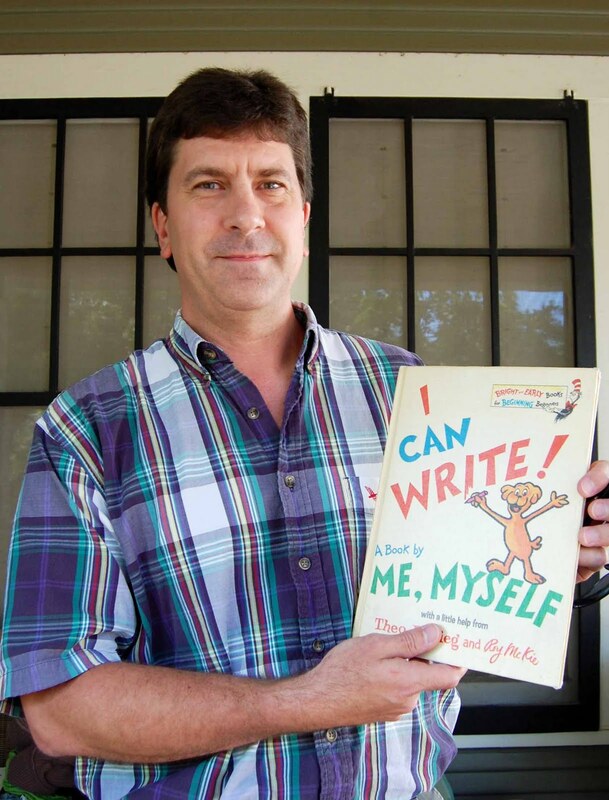 As it reads in the incription, the book was indeed given to Paul Feuerbacher from his brother Dwayne in 1973, but somewhere along the way, it got separated from the family. Back then, Paul was just a first grader with excellent handwriting, and now, he's a teacher, musician and my quasi-neighbor. Man, oh, man what a small, strange world it is. He e-mailed me, we exchanged information, and 38 years later, the book and its original owner were reunited, right on my front porch. I've always been baffled by the idea that everything we've ever owned is somewhere, in some form, floating around the cosmos. Amazing that sometimes a thing can find its way back home. How cool is the Internet, really? That gave me goosebumps! What an amazing story. I often wonder about some of our books, about the inscriptions and old library stamps. That is so fabulous! It is very cool how a book found it's owner again. That is the happiest thing I've read via the internet in a long, long time. Kudos to you for making it all happen! Because I live in the town I grew up in, and get most of our book collection at the local library sales, many of my purchases have the names of friends and families who I know in the town. My favorite was when I emailed a friend from high school that I bought a few of her Little Golden Books, and she emailed me that she wanted them back! this is incredible! what a story!!! !